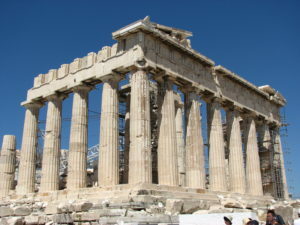 Greece Connect is not like other travel tours to Greece! It’s for solo travelers who want to experience Greek culture and all it has to offer, but prefer not to do so alone. It’s an experience that incorporates structure, personal time, customized small group travel tours, spontaneity, and a shared experience with a diverse group. You won’t have to plan or book a thing. That’s right, leave the work behind and simply soak up each experience! 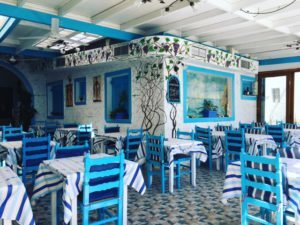 Sun, clear blue seas, archeological sites, glorious food, local wine and everything Greek! More than a holiday, this is an opportunity to explore Greek culture up close and personal…an experience that a camera will never be able to fully capture. 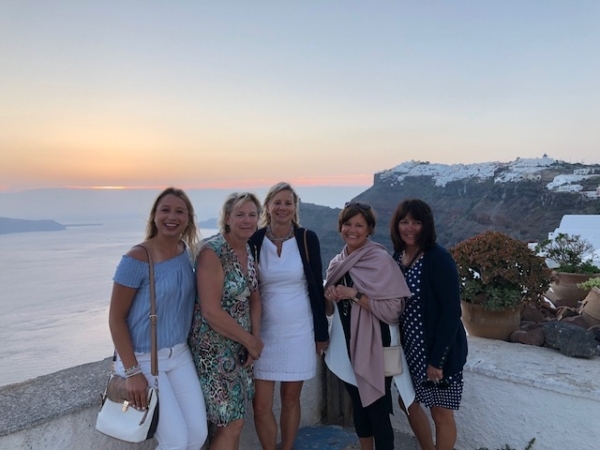 Why should you join Greece Connect? Who is Greece Connect for? Each trip is led by an experienced guide. She will lead all group excursions and serve as your concierge for solo adventures. We also partner with local businesses/experts for certain aspects of Connect trips–see individual itineraries for more information. 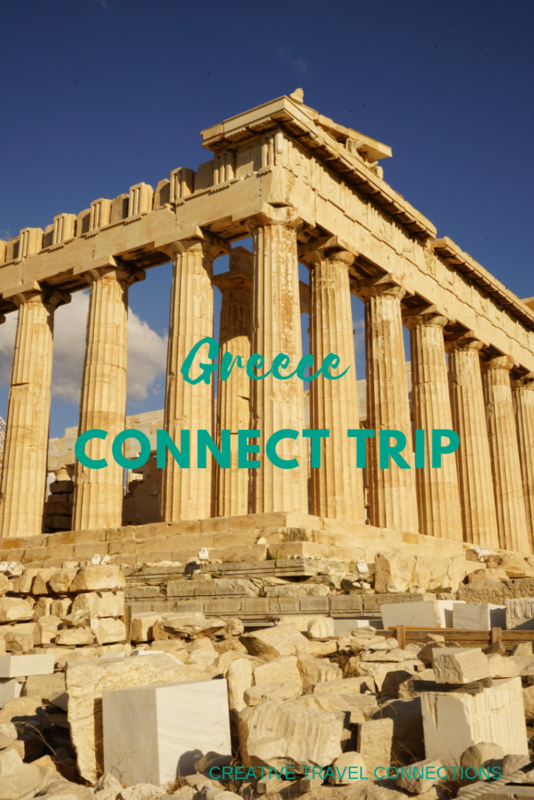 Watch a video from Greece Connect 2017 and Greece Connect 2018. Upon arrival at ATH (Athens International Airport), you’ll be driven to the hotel to get settled in and put your feet up or go for a stroll on historic Athenian streets. The group will meet in the hotel lobby at 6:00 p.m. and head to a rooftop welcome dinner with a view to start getting to know one another. At the welcome dinner, we’ll review the itinerary for the next 2 days in Athens and you’ll receive a packet with maps of the city, public transportation passes, archaeological site passes, etc. We will embark on a tour of the city that mixes modern and ancient landmarks, including the Acropolis, Ancient Agora, Temple of Zeus, Olympic Stadium, National Gardens and much more. We’ll be sure to stop along the way for Greek coffee time, slouvaki, and gelato…of course! Travelers will be presented with various entertainment options for the evening—theatre, outdoor movie, art and culture, shopping, concerts, dancing, and more. Or if you need to go back to the hotel and rest your feet, that is always an option! 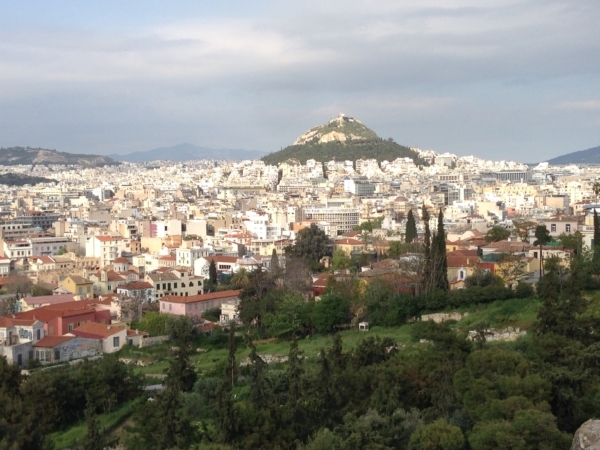 Spend the day exploring more of Athens, including the National Archeological Museum, Lykavittos Hill, and more. Bargain shop throughout the historic Plaka, and hit the trendy Syntagma designer stores. 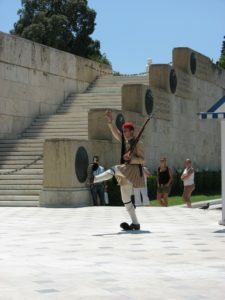 Stop in Syntagma Square to watch the changing of the guard in front of the Greek Parliament. 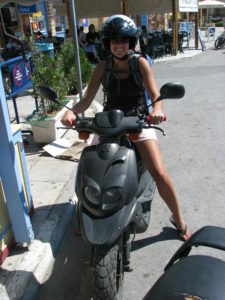 Additional Options: Day trip to Cape Sounion, Korinthos, or Delphi (extra cost for these day trips). Or spend the day at the beach. Information for these options will be available upon arrival. We’ll gather for dinner at 8:00 p.m. (eating on “Greek time”!) and look forward to our island hopping that will begin the next day! We’ll sail from Athens to explore the famous island of Mykonos in all its glamour and liveliness. 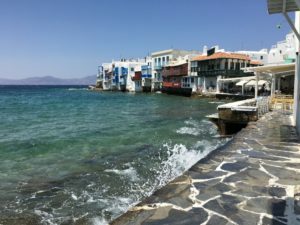 The group will take in Mykonos town and its waterfront wonderland. 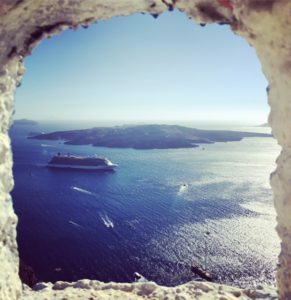 In the afternoon, we’ll continue on to the extraordinary gem of the sea, Santorini. The ride there is almost as breathtaking as the island itself. Get your cameras ready! Note: Ferries (some smaller and high speed) will be our mode of transportation to the islands. If you are prone to motion sickness, be sure to take precautions in case of rough seas. After a slow start to the morning, we’ll head out as a group on a site seeing excursion of the island. Santorini is a geological wonder with some of the most picturesque architecture and views in the world. 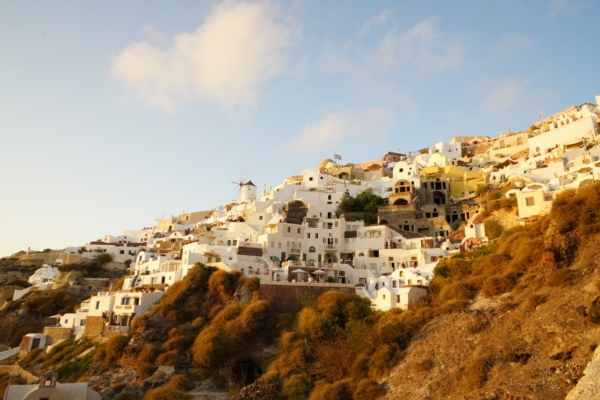 We’ll end the day with a Greek feast on the cliffs of Fira, basking in the beauty of the Santorini sunset. A day of pure Santorini! Go snorkeling or sailing, relax on the beach, enjoy a drink and book at the pool, shop, take a motorbike around the island, and more… spend the day however you want! Today is all about vineyards and views. 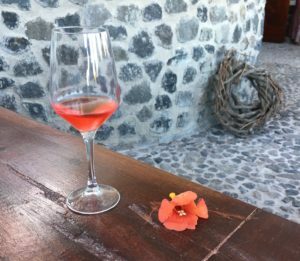 We’ll explore some of the unique wineries around the island and sample Santorini’s best wines. Along the way, we’ll stop to take in some of the unique views and landscape, including red rock beach and a lighthouse atop cliffs overlooking the caldera. And we’ll enjoy more culinary delights while watching the sun drop into the sea. 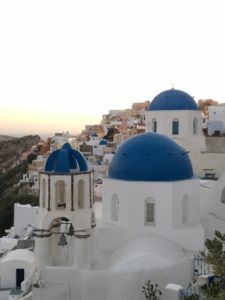 We’ll head out to the village of Oia in the morning to take in that iconic blue roof photo opp! Shop till you drop in the morning in between the breathtaking views. In the afternoon, we’ll head back to the hotel and you’ll have the afternoon/evening on your own. Various options are available, including the pool, beach, water sports, shopping, spas, and more! On our last full day together, we’ll journey back to Athens on the Aegean Sea. Once we arrive back to the city you’ll have a few hours on your own, and we’ll all meet up for a farewell dinner. Our hotel is conveniently located near shops for you to grab any last minute souvenirs. You will be responsible to get yourself to the airport, but once we have your flight information we’ll recommend the best options for ground transportation depending on your departure time. Julie will help you get your ground transportation on Saturday and make sure you get to the airport in time for your flight. Inexpensive options are available any time of day/night. Trip balance is due 45 days prior to departure. The fee is inclusive of single accommodation (non-smoking), ground and sea transportation, admission tickets, meals as noted on the itinerary, and gratuities. This trip requires a minimum of 8 participants (max 12). Now…time to plan the next trip with Creative Travel Connections! The fee is inclusive of accommodations, ground and sea transportation, admission tickets, meals as noted on the itinerary, and gratuities. A $500 USD non-refundable deposit is due upon registration. Full payment is required 45 days before the trip. Cancelations up to 45 days before the trip are subject to a 5% administrative fee based on the full registration cost. 20-45 days before the trip: 15% administrative fee. 0-20 days before the trip: 25% administrative fee. The $500 deposit is non-refundable. Participants are responsible for their own airfare to/from Athens and ground transportation to the Athens airport upon departure. Traveler’s passport must be valid for at least 6 months after date of travel in order to board flights. You will be sent a packing list, optional pre-trip reading, and any other relevant information upon deposit. Really…you just need to pack and get on the airplane with your passport! Travelers will meet each other virtually before the trip. If you’re looking for a customized trip for a group or family, please contact us.